Designed to adapt a standard SAE 7-pin plug (used in Semi Truck/Trailer connection cables) to an SAE 6-pole plug. 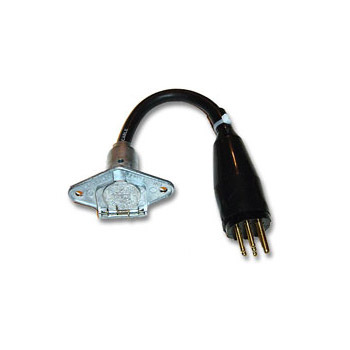 SAE 7-Pin plug — same configuration as all SAE 7-Pin sockets. Adapter has an SAE 6-pole socket on the other end. The marker and tail lights will be both powered per SAE 6 protocol. Fits trailers that have their own cable and SAE 6-pole plug, such as utility trailers and various construction trailers.